Colorado is an incredible place to see a dramatic change into fall and this year's season is upon us. Looking at the image above (via TWC), you'll see the average date that the colors start to appear based on elevation and location. As you can see, it's almost time to get out there and take some incredible Colorado images! Due to the recent cool weather, especially these nice cool nights, our leaf change is about 2-3 weeks ahead of normal schedule. Get out there in the coming days and weeks as to not miss them! I have a few favorite spots to photograph this time of year, but by FAR, the most highly photographed spot in Colorado is the Maroon Bells. Located just outside of Aspen, the Maroon Bells are an easy to access and spectacular photography and hiking location. There is a beautiful lake named Crater Lake, that frames the Bells nicely in the background. To find this view, begin your trek at Maroon Lake at the base of the mountain and follow the trailhead to Crater Lake. They're popular for a reason, and and you shouldn't miss the opportunity to photograph them with the golden aspen leaves and if you're, lucky, a nice snow cap on top. It's easier to get in and out via shuttle from Aspen Highlands during the peak season through Oct. 6 ($6 adults, $4 ages 6-16, seniors); otherwise, you have to pay $10 to take your own car the 10 miles up Maroon Creek Road from Aspen Monday-Thursday. (bus access-only 9 a.m.-5 p.m. Friday-Sunday) and fight for a parking space. 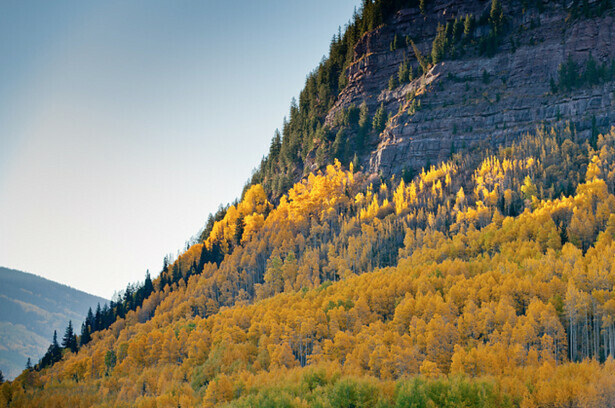 This is one of my images from the Vail Valley taken a previous year. The drive from Vail Pass along I-70 down through the Vail Valley is an insanely beautiful journey that will give you great opportunities to capture the seasonal changes. Another fantastic location is the Peak to Peak highway running between Estes Park and I-70. This scenic byway is littered with expansive views, multiple peaks and valley's and it's covered in gorgeous gold, red and orange Aspen trees in the midst of the fall change. Find any one of the dozens of pull offs to frame your perfect fall picture. Easy access from Denver and a few spots along the Front Range, you'll end up rubbing elbows with lots of other leaf seeking tourists. It won't be the most intimate setting, but the easiest to get to, and worth the trip. Photographing the colors, mountains, and mood isn't the most technical of photography adventures. In fact, these colors are so incredibly vivid, coming up with an image you're happy with shouldn't be too tough. Know the best times to get the lighting you want. Sure, leaves are bright in direct sun, and some great images can be created with the contrast/shadows that direct light creates, but consider those overcast cloudy days. They can really give you a great opportunity to let the those saturated colors pop! Rainy days make everything glisten and can really create a cool image too. The golden and blue hours are also great lighting time slots to create dynamic images. More than anything, use the weather to your advantage. If you have the opportunity to photograph these beautiful colors with fresh snow, brave the cold and go for it. You'll create an eye popping image you'll remember for a long time. Misty or foggy morning's work too. Experiment! - Panoramic's work well to help you capture the fast landscape that you see with your naked eye. Give them a try along with your regular images. Polarizing filters work very nicely eliminating reflection and shine to really let the image pop! If you have a circular polarizer, take it with you on those bright days. Macro lenses are well worth bringing. Up close and personal with the penultimate icon of the arrival of fall makes for a beautiful picture. Bokeh! If you have a fast lens, now is a great time to use it wide open. The smooth brokeh it will create in the background of your subject is incredibly pleasing. Composition is an important part of any type of photography and the fall is no different. Try and keep it simple. Create contrast and try and find some cool perspectives to make your images interesting. Good luck and enjoy the coming fall!